We’d love your help. 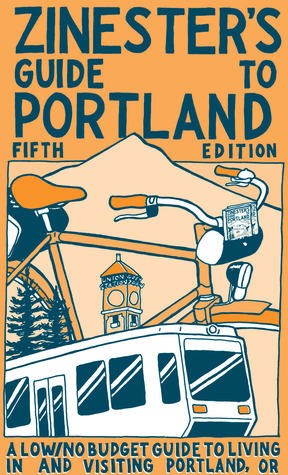 Let us know what’s wrong with this preview of Zinester's Guide to Portland by Shawn Granton. Billed as a "low/no budget guide to visiting and living in Portland, Oregon," the Zinester's Guide to Portland breaks down the PDX grid by neighborhood with descriptions of good restaurants, thrift stores, bars, bridges, places to loiter, etc. (lots of etc.). The newly overhauled and illustrated fifth edition gets shoulder-deep into the history and local lore, providing a Billed as a "low/no budget guide to visiting and living in Portland, Oregon," the Zinester's Guide to Portland breaks down the PDX grid by neighborhood with descriptions of good restaurants, thrift stores, bars, bridges, places to loiter, etc. (lots of etc.). The newly overhauled and illustrated fifth edition gets shoulder-deep into the history and local lore, providing a well-rounded argument as to why (fill in the blank) deserves your time. It also demystifies the TriMet public transportation system, bike events and culture, outdoorsy stuff, the public libraries—basically anything you need to know as the new kid in town. To the wrong eyes the book's title might imply a guide to Portland zine culture, but as editor Shawn Granton says in the introduction, the Zinester's Guide is not just for zinesters, that "It's always been about sharing the interesting and unique things that make Stumptown great, and also helping people get by that aren't swimming in scads of money." For those of us that can't so much as dogpaddle most days, this is "community" at its mightiest. To ask other readers questions about Zinester's Guide to Portland, please sign up. I read the first edition long ago. I need another to show me the cool places in Portland to find bargains. A cute, helpful little book! The book itself is very Portland-y, was going to give 4/5 because it left out a couple of my favorite places, but I figured it will probably help me find new places... so I gave it an extra star. Ok, so I didn't read every single word in this guidebook. It's not the kind of book you have to read cover to cover in order to know it's excellent. Cassidy received this book while he was in prison, and he sent it to me when he was done with it. Before he sent it to me, he had his Portland friends annotate it. It rocks! Written in next to the Goodwill bins are the words "It's God!" This book describes the Portland of most interest to the zine set, sector by sector. I read the opening sections des Ok, so I didn't read every single word in this guidebook. It's not the kind of book you have to read cover to cover in order to know it's excellent. I read the opening sections describing Portland as a whole and sectors and neighborhoods too. Then I skimmed the attractions of each sector and made note of which ones I have seen and which ones I want to see. I ordered this guide for $4 from Microcosm Publishing--an amazing deal for an amazing little book. It's written by locals and includes drawings of Portland neighborhoods and landmarks by Portlanders. I'm looking forward to eating at many of the recommended restaurants and really appreciated the extended chapters on public transit, biking, and miscellaneous Portland yore. I'll have more to report after I visit PDX in July. I have not made a trip to Portland yet (perhaps later this year). This guide certainly fans the fire. I like the way the guide breaks down the city sections and the short, (mostly)unbiased reviews of the various establishments. What's best about this guide is that it is totally DIY with mostly independently owned businesses listed. Many of the the areas are hand illustrated by artists. A must for anyone on their way to Portland, zinester or not. Great information about all the best places to get delicious meals, hot coffee, art supplies, bevvies, bikes, books, and yes, comics and zines. Probably the best guide to Portland I have found. It's written by people who live here about the places that make Portland special. Also, it's broken down by neighborhood which makes it easy to navigate around. This is a great guide to Portland on the cheap with lots of great suggestions. I'm going to Portland in Sept. Let you know then if it works practically. Best city guide i have ever read. This book helped me to find a lot of neat places around the city when I first moved here. Don't judge; it's saving my life these days. Invaluable little book that will truly help you feel your way around Portland. so handy when you're in the city of roses!